I am slowly awakening from a deep sleep to unfamiliar sounds - short, shrill squeaks. I reluctantly climb out of bed and turn on the light. My two young cats, Peace and Joy, are tensely crouched at the closet door with tails twitching, intently staring at something. Suddenly a MOUSE streaks past me and runs under the dresser. Sleepy and startled, I stand in amazement. I am very new to being a cat guardian so am at a complete loss as to how to handle this situation. The thought that women are supposed to be afraid of mice ... and cats are supposed to catch them crosses my mind. So I pull the dresser from the wall for easier access. The cats start for the mouse and SUDDENLY it runs back into the closet. The cats then stand guard at the closet door as the mouse continues to squeak intermittently. I am realizing that this is probably their first encounter with a mouse, it is 3AM and I am very tired. I decide to lie down and actually start to drift back to sleep. Suddenly I am absolutely wide awake as a horrifying thought occurs to me --- that I am doing to this mouse exactly what the world did during the Holocaust. We slept while human beings were being killed. I jump out of bed and enclose the cats in a separate room. I wonder how to catch the mouse. I pick up my slipper sox and envision carrying the mouse outside in it. But how to attract the mouse into the slipper. Not really believing that it could work, I kneel at the closet door and gently say to the mouse, "If you will run into my slipper, I will save you." THE MOUSE RUNS INTO MY SLIPPER. I cannot believe it was so easy but I can feel the mouse in my slipper. I carry the mouse outside the back door to freedom and go back to bed in wonderment with Peace and Joy. The next day I wonder if anyone will believe my story so I say nothing. That night, while checking doors before going to bed, I see Peace and Joy in their mouse alert stance at the kitchen cupboard. 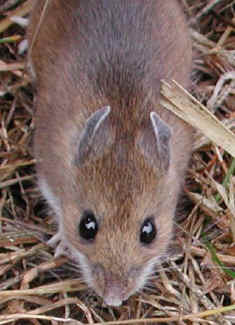 I open the door and a (the) mouse streaks across the kitchen floor to the adjoining laundry/furnace room. It hides behind the furnace. So - I enclose the cats in a separate room and get my slipper sox. Again, not really believing it could work, I kneel by the furnace and gently say to the mouse, "If you will run into my slipper, I will save you." THE MOUSE AGAIN RUNS INTO MY SLIPPER!!!! I am realizing the mouse may have been attracted to my house by discarded pastry in the garbage container in the kitchen cupboard. (Since becoming an animal guardian, I am surprised to find myself in the process of becoming vegan causing non-vegan pastry to be repulsive.) I decide to remove the possible attraction permanently. It is a dark and stormy night but I wonder if I had not taken the mouse far enough from the house last night. Therefore I take an umbrella and carry the mouse to the far edge of my back yard where I release it into the underbrush not to be seen since. I am grateful not to have ignored the dilemma of this mouse and am amazed at the lesson in compassion for all beings I was able to learn.